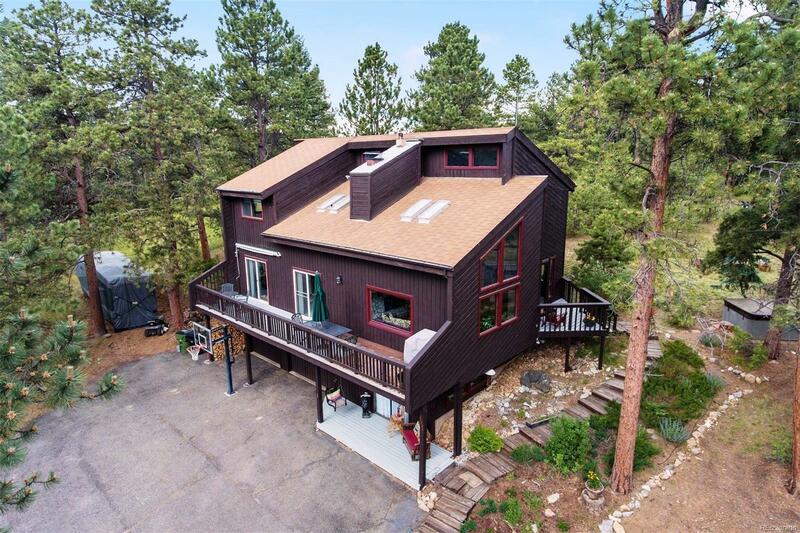 Quiet hilltop setting at the end of a private cul-de-sac in desirable Evergreen Meadows. The outside roof lines and angles display a unique architectural style created by the builder. This design can be observed throughout the home starting with the high vaulted ceilings, well placed windows and the center piece of the home; a double-sided white stone fireplace which divides the living and dining rooms. The adjoining kitchen, with knotty pine cabinetry, also offers plenty of countertop space, stainless appliances, and newer engineered hand scraped hickory wood floors. An open stair rail leads up to a loft walkway and three bedrooms including the master suite with a private balcony. The walkout lower level has the family room with a handsome floor to ceiling stone surround for the Quadra Fire wood stove. The two car garage and laundry are also in the lower level. Please make a point to stroll around the two plus acres of native grasses and towering ponderous, it has a park like setting.